Some of the valley’s smallest animals are its most interesting. Mother Nature made Grand Teton National Park, but it’s a team effort—with the 100-year-old National Park Service playing quarterback—that keeps the park looking its best. In Jackson Hole, a ‘Picnic’ involves 67 miles of biking, swimming, hiking, and climbing. A bike ride Around the Block is 109 miles. Crown Jewels at the End of their Golden Age? As the National Park Service turns one hundred, the examples set by—and the problems seen by—Yellowstone and Grand Teton parks are more important than ever. In Jackson Hole, snowmobiling isn’t just a sport, but a culture. 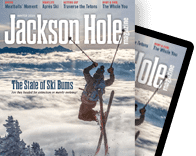 At fifty years old, Jackson Hole Mountain Resort has grown up while staying true to its founders’ visions. A recent landslide in the Gros Ventres is like a science book come to life. Views of it are an easy(ish) hike away. Jackson Lake is a jewel for recreationalists, whether they’re looking to catch fish or a wild ride. Yellowstone’s thermal features are out of this world.